Dr. Debbie Innes-Gomberg, Ph.D. Deputy Director for the Adult Systems of Care for the Los Angeles County of Mental Health, M.D. Director of Adult Outpatient Program Harbor UCLA Medical Center will speak at our monthly meeting on Monday, February 27, 2017. Dr. Innes-Gomberg will be speaking about the Department of Mental Health (DMH) Mental Health Services Act (MHSA) three-year program with regard to services and programs, performance of programs, and the involvement of families and community involvement in the development and implementation of the plan. 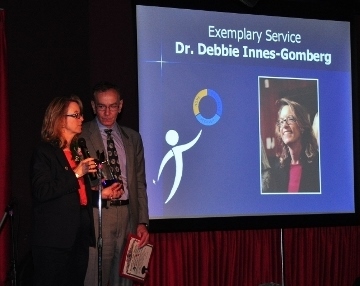 Dr. Innes-Gomberg has a long history with DMH as a clinical psychologist, District Chief for the Long Beach/South Bay area and the the Program Manager for the MHSA Implementation and Outcomes Division. This presentation will be a great opportunity to ask questions about the programs and address concerns and needs in our area. Don’t miss this special event: Friends of Family, sponsored by LACDMH Office of Consumer and Family Affairs, with special guest speaker Martin Hernandez L.C.S.W., new Director of Patients’ Rights, this Saturday from 10 to Noon in Commerce at 6055 E. Washington Blvd., 9th Floor, Bank of the West building. Click THIS LINK or the Image to the right for full-sized and printable PDF flyer. Please join NAMI South Bay for its October monthly meeting with the Caring and Sharing Support Group beginning at 6 p.m., and the Speaker Meeting starting at 7:30 p.m. at First Lutheran Church, 2900 Carson Street in Torrance. The speaker for this meeting will be Ruth Hollman the Executive Director of SHARE, a leading advocate for housing for persons with a mental illness and other programs. Since 1993, SHARE! the Self-Help And Recovery Exchange has served people though self-help support groups and communities that provide recovery and social support. SHARE!’s programs-include collaborative housing, self-help centers in Culver City and Downtown, the Recovery Retreat and Volunteer-to-Job internships designed to support self-sufficiency through social support and community integration. This innovative approach was honored with the Los Angeles County Mental Health Commission Outstanding Program Award in 2013.